This has been a tough week for journalism. Jon Stewart is leaving The Daily Show. Brian Williams’ whole career is under investigation. CBS correspondent Bob Simon is killed in a Manhattan car crash, after surviving dozens of combat assignments. And now, David Carr has died, for no discernible medical reason, other than his checkered health past. It makes you ask, WTF anyway? As I was coming home from the theater last night, I realized I hadn’t turned my phone on. 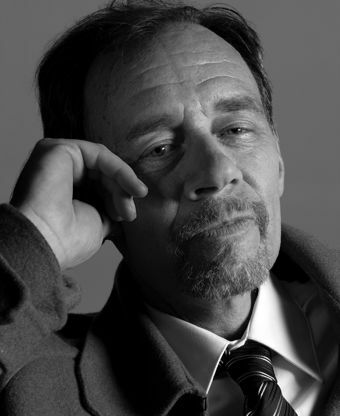 A shocking headline popped up on the screen: David Carr, New York Times media columnist, is dead at 58. What? How could this be? I just read his article on Jon Stewart and Brian Williams today. I started looking for information and there wasn’t much available yet. The Times had a brief obituary, which was expanded over the next couple of hours to become a meaningful overview of Carr’s career. However, Twitter was on fire with news about Carr’s death and comments about his life and work. I tweeted and retweeted about a dozen times last night alone. Someone tweeted a link to the Carr archive on nytimes.com: a total of 1,776 articles. Last night Carr had just moderated a panel discussion about the film Citizenfour with its principal subject, Edward J. Snowden; the film’s director, Laura Poitras; and journalist Glenn Greenwald. Just before 9pmET, he collapsed in his office and was taken to the hospital, where he died. That headline about him flashed on my phone at 9:30pmCT. Carr grew up in a Minneapolis suburb, graduated from the University of Minnesota and worked as editor of the Twin Cities Reader, an alternative paper. During this time, he became an alcoholic, began using cocaine and became a crack addict. He and his girlfriend had twin girls and Carr raised them alone on welfare. A single dad crack addict. He kicked the crack habit and later suffered from cancer (Hodgkin’s lymphoma), which required a lot of radiation to his mouth and throat. He said in a radio interview: “I’ve had a very medicalized life. I have no spleen. I have one kidney. I have no gallbladder. I have half a pancreas.” He said his notably raspy voice was the result of many factors, including smoking tobacco and crack, radiation, and working on the pile covering firemen at the 9/11 site. It was during that time, he said, that he noticed his voice changing. He left Minnesota for DC to become editor of the Washington City Paper, later moving to New York, where he wrote as a freelancer for publications including The Atlantic Monthly and New York magazine. He joined the Times in 2002 as a business reporter covering magazine publishing. He expanded that beat to include new media, and generally, the web and all media. He remarried and he and his wife have three children and a home in New Jersey. Carr wrote a memoir of his life as a crack addict, Night of the Gun, published in 2008. He didn’t just write it as others write memoirs—from memory. He decided he had forgotten too much and attacked the project like a reporter, gathering documents and interviewing about 60 people. “Me and My Girls,” a long excerpt from that memoir, was published in July 2008 in the NY Times Magazine. You can read it here. My favorite quote of Carr’s, from the conclusion of his memoir, has been cited often today. Carr was my favorite journalist. He was voracious in his interests, which ranged all over the media and pop culture spectrum from ownership and management to the way new media affect the artists and their livelihoods. He was interested in music, pop and otherwise, movies, books, magazines and web culture. He wrote long features on artists such as Neil Young and Woody Harrelson, on South Park, and on Murdoch vs. Bloomberg. The one time I saw Carr live was during the 2011 Chicago Humanities Festival, when he and Clara Jeffrey, coeditor of Mother Jones magazine, discussed “New Frontiers in Journalism.” It was Wednesday, November 9, 2011, on the stage at Francis Parker School. I was excited to be able to see him and listen to him talk in an informal format. I didn’t take notes that evening, for some reason. However, there’s this video …. Carr also is the star of an excellent documentary about modern journalism: Page One: A Year Inside the New York Times. In the 2011 film, Carr is shown working on one of his best stories, his takedown of Sam Zell’s Chicago Tribune and its frat house culture. Carr and A.O. Scott, the Times’ film critic, had a web series for a while titled “The Sweet Spot.” The two writers would sit in what looks like the Times employee cafeteria in their shirtsleeves talking about some cultural phenomenon that interests them. These 5-6 minutes videos are always fun. You can see a bunch of them here on the Times video channel. The series ended in 2013. Every Monday, Carr had a Media Equation column in the Times business section. Every Monday morning, I would first read Paul Krugman on the economy and then Carr, filling myself full of juicy news concepts. Mondays are not going to be the same. But in the meantime, I’ll keep typing until it turns into writing. Postscript on 02/15/15: The medical examiner’s autopsy showed Carr died of metastatic lung cancer, with heart disease a contributing factor. Nancy — what a beautiful tribute to David Carr. His life reads like a movie except it isn’t fiction. It’s unusual that achieved the success that he did considering his self-destructive path in his early years. It shows that there is redemption. Thanks for your comment, Jeannette. Yes, Carr’s story does make you believe in second acts, if not redemption. His death makes his quote about being grateful for the caper and hoping it doesn’t end any time soon even more poignant.